Competition in the streaming TV market is heating up. Google announced that it will launch a new service called YouTube TV in major cities in the United States over the next few months. Digital Intervention > Digital Intervention > Blog Posts > 2017 > YouTube TV is Coming – Can You Cut the Cord with Cable? YouTube TV is Coming – Can You Cut the Cord with Cable? 1 Billion hours of video consumed a day. Wow. Competition in the streaming TV market is heating up. Google announced that it will launch a new service called YouTube TV in major cities in the United States over the next few months. “YES!” Sign up here to be notified by YouTube. With an option like this, could you really “cut the cable” with cable TV? I’m thinking yes. It’s the best attempt, and next step to unraveling the cable companies that have strangled us for years. There are many critics of the new YouTube service, but in my opinion, it’s a great start. And personally, I’m damn close to cutting that cord. It’s almost not about the money anymore, it’s about being free of their silly charges. Here is a quick combination of online services you could subscribe to that will get you what you watch. And I should note that if you watch a lot of TV channels, a lot of specialty channels, then this may not be for you. This is for the folks that watch general TV stations and movies. AMC app: If you’re a walking dead fan for instance, you can get older episodes on Netflix and the new ones are available for free on the AMC app. YouTube stations included in service. The combination would cost $60 a month (optional items not included). And any missing channels like AMC or HGTV you can download their Apps and watch for free. Average monthly costs for FIOS or Comcast is about $75 per month. But then if you add Netflix and other premium movies you’re adding another $35, making the total $110 per month. One other perk with YouTube is that you get unlimited cloud storage (like DVR) for recording. YouTube TV will cost customers only $35 a month, which gets them 6 accounts, 3 of which can be used to stream live TV concurrently, and access to 40 different networks, including “ABC, CBS, FOX, NBC, ESPN, regional sports networks, and dozens of popular cable networks,” according to a recent entry on the official YouTube blog. Each of the accounts will be personalized and utilize searching algorithms, similar to Netflix’s profile system. Users also gain access to YouTube Red original shows and an unlimited cloud DVR (1 per account) to record live TV. Currently, other options on the market include: Dish’s Sling TV, which offers 2 basic packages for $20 and currently has around 764,000 subscribers, and Sony’s PlayStation Vue, with a monthly cost of $40 for 60 channels. Hulu is expected to launch a similar web TV offering sometime this year. Susan Wojicki, the CEO of YouTube, declared that this was the evolution of television, aiming to “give the younger generation the content that they love with the flexibility they expect,” able to watch YouTube TV on their computers, smartphones, tablets, or any device with a Google Chromecast. The habits and methods in which we consume TV/media is changing. And it’s changing rapidly. What’s changing in society is the fact that the younger generations care less and less about traditional TV. They would rather stream everything to their computer or phone. And, they are satisfied with what they get there, and less interested in network TV. Thus, a shift in the cable TV model. So it’s not just the generational gap but the way we consume – Mobile VS TV set. So here are the cons. Plenty of cord-cutters or those who have never signed up for cable are likely to be satisfied. But there are some large gaps. For example, there’s nothing from Viacom, or Time Warner—no CNN or Discovery Channel, no TBS, and no TNT (YouTube is still in discussions with other partners). However, popular channels such as HBO and AMC will not be available at launch. Moreover, Google still needs to figure out deals with the network affiliate stations of major broadcasters in smaller cities, possibly implying that the service will only be launched in larger metropolitan areas to begin with. Overall, YouTube TV’s list of channels is significantly smaller than the 100+ channels AT&T offered under its $35 introductory pricing for DirecTV Now. 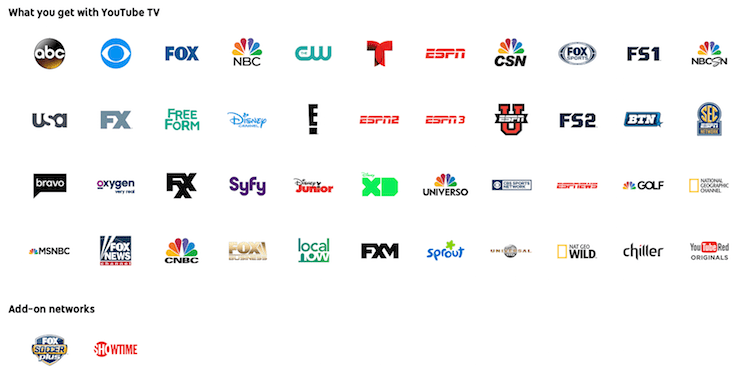 In addition to those gaps, the YouTube TV service is only available in markets where its existing cable partners have affiliates. So if you live in or near a number of major U.S. urban centers, you won’t be able to subscribe even if you want to. All of these caveats make YouTube’s service look a lot less like a cable-TV killer and a lot more like just a digital version of a not-so-great cable package. But like I said in the beginning, this is a start. And I believe a company the size of Google will wheel and deal and make it happen for most cord cutters. It will be interesting over the next couple years to see how watching TV changes. Heres a little how to video for cord cutting. This doesn’t include the YouTube option because it wasn’t announced yet. But where they mention getting a antennal for local TV stations, that is where you insert YouTube as an option.